There are now millions of solar systems installed across Australia, and with generous government incentives still available solar power is becoming a no-brainer for households that are able to use solar power as it is generated during the day. But what is the real price of solar power vs the grid? Let’s do the maths. According to the Clean Energy Council Guidelines, a solar power system in Sydney generates 3.9 kWh a day per kW. For example, a 5kW system will produce 19.5 kWh a day, averaged out across the year (it will produce more power in summer and less in winter). We have found this figure to be conservative, but let’s stick to the guidelines for this one. 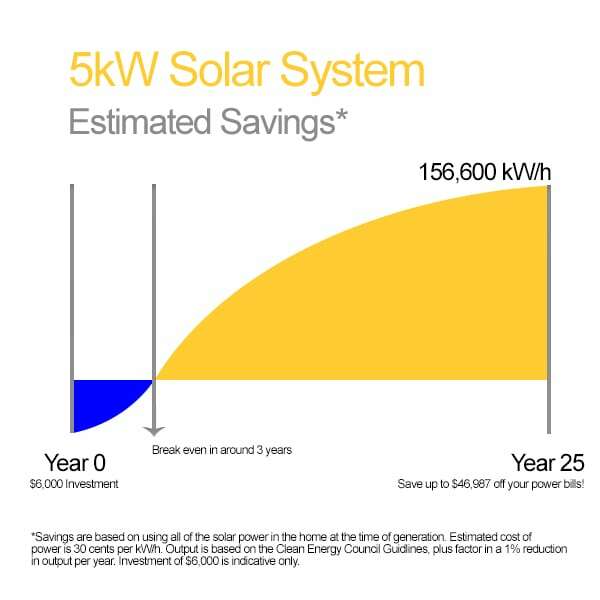 LG Solar NeON 2 panels come with a 25-year performance warranty, that states that after 25 years the panels will generate at least 86% of their original output. For example, a 325W panel will be producing 286W after 25 years. So in the first year, a 5 kW system might produce 7,117 kWh and in the 25th year, it may produce somewhere in the ballpark of 5,700 kWh. Let’s budget $2,000 for repairs and replacements. The price of a solar system varies depending on the quality of the products you buy, so let’s look at two options, using Trina Honey 265W panels with either a European Made string inverter or Enphase Microinverters. As a ballpark figure, the string system will cost $6,000, plus the $2,000 for a new inverter/ repairs. If we expect the system to produce 156,600 kWh over 25 years, we have a cost of 5.1 cents per kWh. With the Enphase system, let’s go with a ballpark cost of $7,000 plus the $2,000 for repairs and replacements. If we expect the system to produce 156,600 kWh over 25 years, we have a cost of 5.7 cents per kWh. Due to the panel level output of Enphase systems, on average our Enphase systems output 110% of their expected performance. Therefore, you can expect to get significantly more output from your Enphase system than the Clean Energy Council Guidelines. This increase in output along with a significantly longer life expectancy means the cost of an Enphase system is approximately the same as a standard inverter per kWh over the life of the system. How does this compare to the cost of power from the grid? On average, a house in Sydney pays around 22 to 30 cents a kWh, and up to 52 cents between 2 pm and 8 pm if you have time of use billing. It quickly becomes apparent why solar power is so popular! It is so much cheaper than buying power from the grid. The biggest factor that affects your price per kWh is whether you are able to use the solar power in the home or whether you send it off to the grid. A typical feed-in tariff is now around 13 cents a kWh, so even if you don’t use some of your solar power, you are buying it for around 5 cents per kWh and then selling it at a profit for around 13 cents per kWh. This is why so many households are now getting much larger solar systems. Please drop us a comment below if you have any questions, or submit your details for a quote. We can help you accurately size up a solar system to maximise the benefit of your system and help you select brands that will maximise the performance of your system in all weather conditions.